The type of car the story and song is based on: the two seater roadster. This story has been made popular by the rock band Rush, their song “Red Barchetta” based off of it. It still remains my favorite song of all time. 2112.net‘s version is in plain HTML with no formatting, which isn’t readable at all on mobile devices. It was a fine morning in March 1982. The warm weather and clear sky gave promise of an early spring. Buzz had arisen early that morning, impatiently eaten breakfast and .gone to the garage. Opening the door, he saw the sunshine bounce off the gleaming hood of his I5-year-old MGB roadster. After carefully checking the fluid levels, tire pressures and ignition wires, Buzz slid behind the wheel and cranked the engine, which immediately fired to life. He thought happily of the next few hours he would spend with the car, but his happiness was clouded – it was not as easy as it used to be. A dozen years ago things had begun changing. First there were a few modest safety and emission improvements required on new cars; gradually these became more comprehensive. The governmental requirements reached an adequate level, but they didn’t stop; they continued and became more and more stringent. Now there were very few of the older models left, through natural deterioration and . . . other reasons. The safety crusade had been well done at first. The few harebrained schemes were quickly ruled out and a sense of rationality developed. But in the late Seventies, with no major wars, cancer cured and social welfare straightened out. the politicians needed a new cause and once again they turned toward the automobile. The regulations concerning safety became tougher. Cars became larger, heavier, less efficient. They consumed gasoline so voraciously that the United States had had to become a major ally with the Arabian countries. The new cars were hard to stop or maneuver quickly. but they would save your life (usually) in a 5O-mph crash. With 200 million cars on the road, however, few people ever drove that fast anymore. Buzz zipped quickly to the valley floor, dodging the frequent potholes which had developed from neglect of the seldom-used roads. The engine sounded spot-on and the entire car had a tight, good feeling about it. He negotiated several quick S-curves and reached 6000 in third gear before backing off for the next turn. He didn’t worry about the police down here. No, not the cops . . . Despite the extent of the safety program. it was essentially a good idea. But unforeseen complications had arisen. People became accustomed to cars which went undamaged in lO-mph collisions. They gave even less thought than before to the possibility of being injured in a crash. As a result, they tended to worry less about clearances and rights-of-way, so that the accident rate went up a steady six percent every year. But the damages and injuries actually decreased, so the government was happy, the insurance industry was happy and most of the car owners were happy. Most of the car ownersi-the owners of the non-MSV cars were kept busy dodging the less careful MSV drivers, and the result of this mismatch left very few of the older cars in existence. If they weren’t crushed between two 6000-pound sleds on the highway they were quietly priced into the junkyard by the insurance peddlers. And worst of all, they became targets . . .
Buzz was well into his act now, speeding through the twisting valley roads with all the skill he could muster, to the extent that he had forgotten his earlier worries. Where the road was unbroken he would power around the turns in well controlled oversteer, and where the sections were potholed he saw them as devious chicanes to be mastered. He left the ground briefly going over one of the old wooden bridges and later ascertained that the MG would still hit 110 on the long stretch between the old Hanlin and Grove farms. He was just beginning to wind down when he saw it, there in his mirror, a late-model MSV with hand-painted designs covering most of its body (one of the few modifications allowed on post-1980 cars). Buzz hoped it was a tourist or a wayward driver who got lost looking for a gas station. But now the MSV driver had spotted the MG, and with a whoosh of a well muffled, well cleansed exhaust he started the chase . . . It hadn’t taken long for the less responsible element among drivers to discover that their new MSVs could inflict great damage on an older car and go unscathed themselves. As a result some drivers would go looking for the older cars in secluded areas, bounce them off the road or into a bridge abutment, and then speed off undamaged, relieved of whatever frustrations cause this kind of behavior. Police seldom patrolled these out-of-the-way places, their attentions being required more urgently elsewhere, and so it became a great sport for some drivers. Buzz wasn’t too worried yet. This had happened a few times before, and unless the MSV driver was an exceptionally good one, the MG could be called upon to elude the other driver without too much difficulty. Yet something bothered him about this gaudy MSV in his mirror, but what was it? Planning carefully, Buzz let the other driver catch up to within a dozen yards or so, and then suddenly shot off down a road to the right. The MSV driver stood on his brakes, skidding 400 feet down the road, made a lumbering U-turn and set off once again after the roadster. The MG had gained a quarter mile in this manner and Buzz was thankful for the radial tires and front and rear anti-roll bars he had put on the car a few years back. He was flying along the twisting road, downshifting, cornering, accelerating and all the while planning his route ahead. He was confident that if he couldn’t outrun the MSV then he could at least hold it off for another hour or more, at which time the MSV would be quite low on gas. But what was it that kept bothering him about the other car? They reached a straight section of the road and Buzz opened it up all the way and held it. The MSV was quite a way back but not so far that Buzz couldn’t distinguish the tall antenna standing up from the back bumper. Antenna! Not police, but perhaps a Citizen’s Band radio in the MSV? He quaked slightly and hoped it was not. The straight stretch was coming to an end now and Buzz put off braking to the last fraction of a second and then sped through a 75-mph right-hander, gaining ten more yards on the MSV. But less than a quarter mile ahead another huge MSV was slowly pulling across the road and to a stop. It was a CB set. The other driver had a cohort in the chase. Now Buzz was in trouble. He stayed on the gas until within a few hundred feet when he banked hard and feinted passing to the left. The MSV crawled in that direction and Buzz slipped by on the right. bouncing heavily over a stone on the shoulder. The two MSVs set off in hot pursuit, almost colliding in the process. Buzz turned right at the first crossroad and then made a quick left, hoping to be out of sight of his pursuers, and in fact he traveled several minutes before spotting one of them on the main road parallel to his lane. At the same time the other appeared in the mirror from around the last comer. By now they were beginning to climb the hills on the far side of the valley and Buzz pressed on for all he was worth, praying that the straining engine would stand up. He lost track of one MSV when the main road turned away, but could see the other one behind him on occasion. Climbing the old Monument Road, Buzz hoped to have time to get over the top and down the old dirt road to the right, which would be too narrow for his pursuers. Climbing, straining, the water temperature rising, using the entire road, flailing the shift lever back and forth from 3rd to 4th, not touching the brakes but scrubbing off the necessary speed in the corners, reaching the peak of the mountain where the lane to the old fire tower went off to the left . . . but coming up the other side of the hill was the second MSV he had lost track of! No time to get to his dirt road. He made a panicked turn left onto the fire tower road but spun on some loose gravel and struck a tree a glancing blow with his right fender. He came to a stop on the opposite side of the road. the engine stalled. Hurriedly he pushed the starter while the overheated engine slowly came back into life. He engaged 1st gear and sped off up the road, just as the first MSV turned the corner. Dazed though he was, Buzz had the advantage of a very narrow road lined on both sides with trees, and he made the most of it. The road twisted constantly and he stayed in 2nd with the engine between 5000 and 5500. The crash hadn’t seemed to hurt anything and he was pulling away from the MSV. But to where? It hit him suddenly that the road dead-ended at the fire tower, no place to go but back . . . Still he pushed on and at the top of the hill drove quickly to the far end of the clearing, turned the MG around and waited. The first MSV came flying into the clearing and aimed itself at the sitting MG. Buzz grabbed reverse gear, backed up slightly to feint, stopped, and then backed up at full speed. The MSV, expecting the MG to change direction, veered the wrong way and slid to a stop up against a tree. Buzz was off again, down the fire tower road, and the undamaged MSV set off in pursuit. Buzz’s predicament was unenviable. He was going full tilt down the twisting blacktop with a solid MSV coming up at him. and an equally solid MSV coming down after him. On he went, however, braking hard before each turn and then accelerating back up to 45 in between. Coming down to a particularly tight turn, he saw the MSV coming around it from the other direction and stood on the brakes. The sudden extreme pressure in the brake lines was too much for the rear brake line which had been twisted somewhat in his spin, and it broke. robbing Buzz of his brakes. In sheer desperation he pulled the handbrake as tightly as it would go and rammed the gear lever into 1st, popping the clutch as he did so. The back end locked solid and broke away, spinning him off the side of the road and miraculously into some bushes, which brought the car to a halt. As he was collecting his senses, Buzz saw the two MSVs, unable to stop in time, ram each other head on at over 40 mph. It was a long time before Buzz had the MG rebuilt to its original pristine condition of before the chase. It was an even longer time before he went back into the valley for a drive. Now it was only in the very early hours of the day when most people were still sleeping off the effects of the good life. And when he saw in the papers that the government would soon be requiring cars to be capable of withstanding 75-mph headon collisions, he stopped driving the MG altogether. It’s funny: replace the word “MSV” with “Crossover” and this story is only slightly fictional. Sure, crossovers aren’t total gas hogs (at least compared to their SUV brethren, which we’ve all seen dip into the single digits for MPG values), but they certainly use more petrol than the cars they’re based off of. That, combined with their increased mass and higher ride height – along with the Bay Area’s notorious traffic – make A Nice Morning Drive a reality. 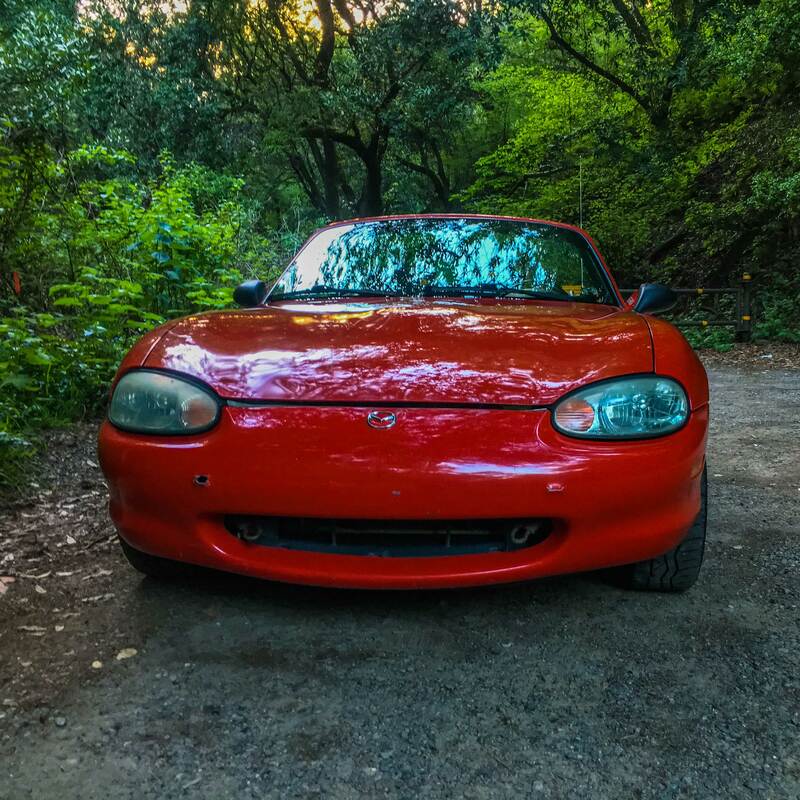 Driving my Miata anywhere near the towns or freeways has become a nightmare simply because I figure that most of the time the crossovers can’t see you – or if they do, they simply don’t care about the damage/injuries that you might suffer in a collision, and do things such as tailgate you and dangerously cut you off. Hell, I’ve had one chase me at speeds far above the limit, him being a few yards at most away from my tail – just because he was upset that I flashed him for being slow in the fast lane, and without any regards to the consequences of his actions. For those reasons, Mia stays at home most of the time – and when I do take her out I take her to the back roads that the crossovers have a hard time navigating with their twists and turns. And even if I find a crossover on them, passing is trivial because Mia can turn on a dime. I wish I could bring some kind of good news, but alas the crossover craze is only growing – Ford is even discontinuing all cars in the US besides the Mustang. Furthermore, with the unrealistic EPA 2025 regulations pushing automakers to produce more crossovers (since they’re counted as trucks, they have much more relaxed regulations), and with the increased profits that automakers, auto parts companies, tire companies, and oil companies make because crossovers consume more of everything – it would seem that everyone besides the ignorant consumer, the enthusiast, and the environment wins. I suppose the best we can do going forward is inform your parents, friends, or coworkers the long list of good reasons NOT to get a crossover. NEXT POST Next post: Canon EOS Elan IIe First Impressions: Autofocus? More like Automagic.